My daughter left her clothes in the dryer…again. As I pulled them out and piled them in her basket, I burst out laughing because I found a pair of green basketball shorts. These shorts have a story. I purchased them as practice shorts for my son when he played basketball about six years ago. We had a problem with the washer catching our clothes and eating them. The problem was fixed, but not before it ate a few holes in these shorts. I sewed the pockets shut and used the pocket material to make round patches. I sewed them on using a zigzag stitch and added extra stitching to make each round patch look like a basketball. My son hated them. He refused to wear them. But, my daughter thought they were cool! I realized she is still wearing them today. Pockets are the perfect material to use for patches because they match the rest of the item. 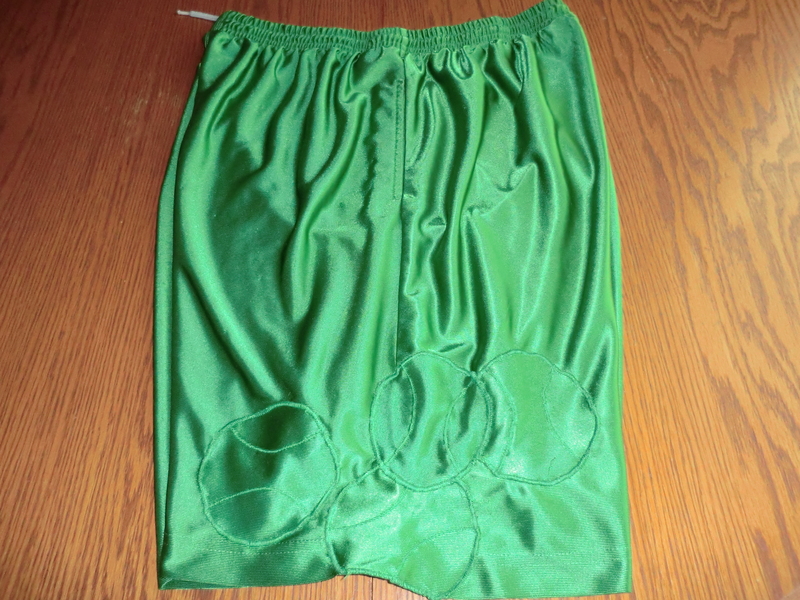 The basketball shorts I repaired with the material from the pockets. This entry was posted in Clothes, Repair, Use What You Have and tagged Clothes, Repair It, Use What You Have by Frugal Fish. Bookmark the permalink.